3dktop : strong and heat resistant filament? I ordered a spool of 3dktop to check and plan to use it for all structural parts within the printer. 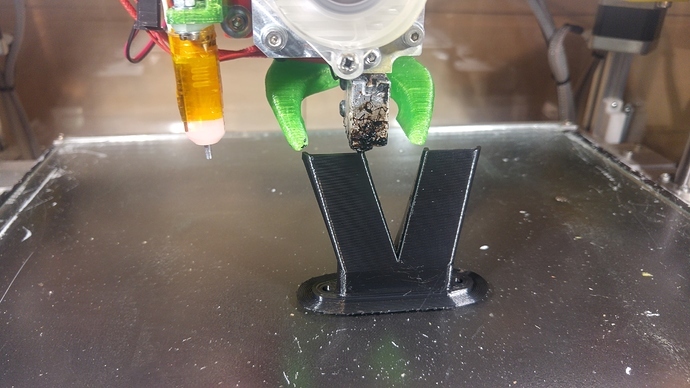 Especially for the print head and the parts connected to the steppers. I'm always a bit cautious about these wonder-nothing-but-extremely-well-suited-for-all-you-can-imagine materials, but this one got my attention. So ... waiting for the spool in my mailbox. Very looking forward to your findings. Will be traveling the rest of the week, so testing will probably be somewhere next week or a small cube this evening(?) if I can't resist the temptation of course..
Specs according to their website after annealing : up to 100°C rocksolid, almost no T-glass and almost rocksolid from 100°C up to 230°C. 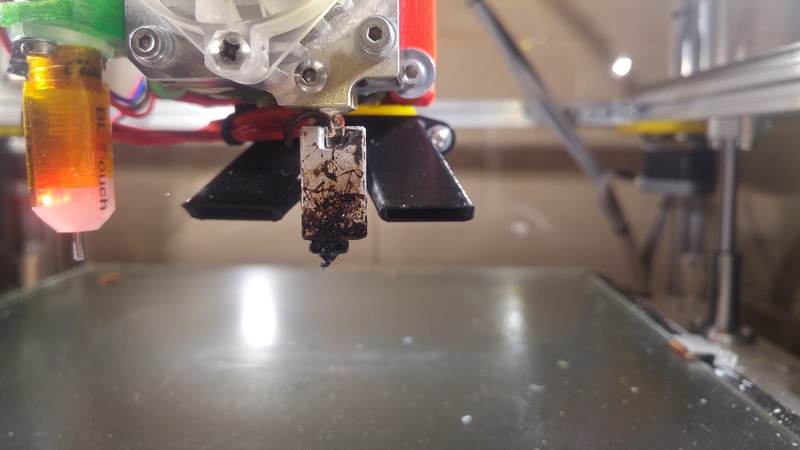 Prints between 230 and 260°C, larger prints need a heated bed, smaller ones would not require that. After that an annealing/curing process in an oven at 110°C time depending on the mass and then let the print cool down with the oven. This should bring the print to its final strength. So yesterday I finally got the time to do a first quick test by printing a hollow vase mode cube. Temp set at 250°C and 80°C for the bed 0,2mm layer height and of course with my favorite 0,6mm nozzle.. Closed printing chamber. Watched the first mm and saw then the result afterwards. Looked nice at the start. Will try to find some time to do some more tests this weekend. @PaulS : check ASA for that. It is a better 'version' of ABS and as one of its unique properties : very high UV-resistance! Needless to say that in the sun the white versions are better off then the black ones ... at least for heat resistance. how about something as strong as aluminum and uv resistant??? Ha Paul, now you're checking me. Yes : I've read your posts! wondering if PC would be a good fit. hurry up with those results would ya? PC is pretty hard to print well. I believe it is also UV tolerant. If you are up to the challenge, it might work out. ASA is advertised as being strong like ABS yet prints like PLA. As someone who uses it, is this true? It is a better ABS. If it's stronger, I don't know. I didn't measure, but it is at least as strong as ABS. It prints with a glossy surface. And is also prone to warping just like ABS. They use it a lot in automobile. So printing like PLA, I wouldn't say. The laying down perhaps yes. Did finally some more testing with the 3dktop. Printed a couple of real things and one of them is a new shroud for the partcooler. The print went extremely well and smooth. The result is a glossy surface. After that 1 hour in an oven at 110°C to make it more chrystalline and to give it its final properties. 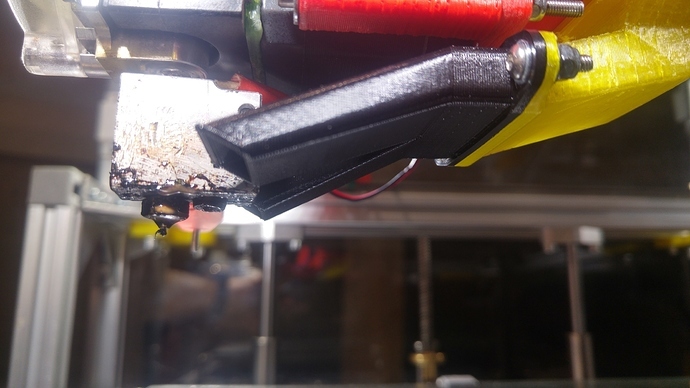 I didn't see any difference, but as it is mounted now at 5mm from the hot end even after sitting 1 hour next to the hotend at 240°C and without fan it is still solid.